Looking at a completed nest, it is really remarkable to think that the birds built it, one stick at a time. What an incredible endeavor of hard work! I visited the Viera Wetlands this morning where there are now around 7 Great Blue Heron nests in the area of the south end of the lake/north side of cell one. The majority of the nests are on top of palm trees, however, one is currently being built on a man made platform. 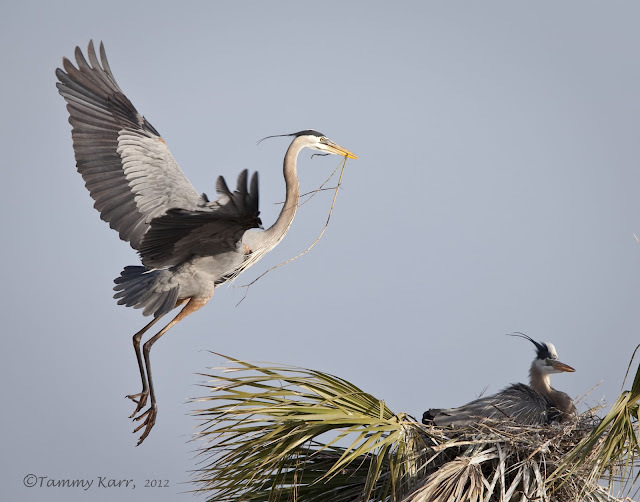 Some of the Herons have already been nesting for over a month, while some for just a few weeks. 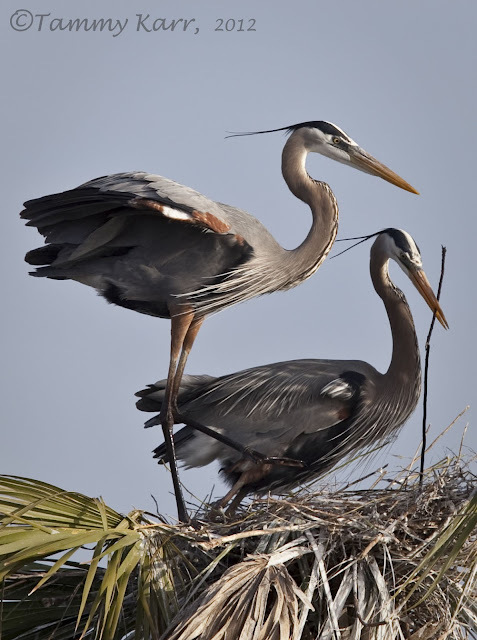 While it usually takes around a week for a nest to be completed to the point where eggs can be laid, herons continue to construct their nests throughout the whole time they are nesting. The day started out with a heavy overcast of clouds, but the sun pleasantly made a surprise appearance later in the morning. My son and I watched these GBHs work diligently for over two hours. It was quite a remarkable experience to watch their teamwork. The sequence started the same way each time, with the male landing in the reeds and retrieving some material. With his hard earned piece of materiel, the heron would lift off, circle the tree and come in for a landing from the west, to coincide with the wind. 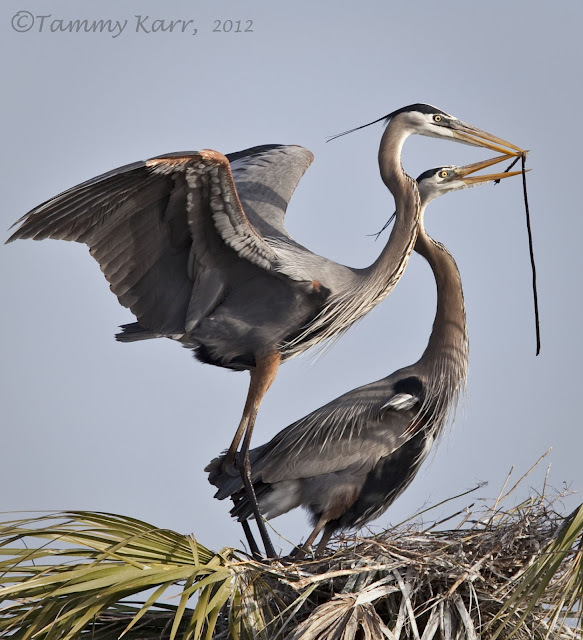 As her partner arrived, the female Great Blue Heron would rise to retrieve the material and work it into the nest. The herons repeated this sequence continually the entire time we were viewing. 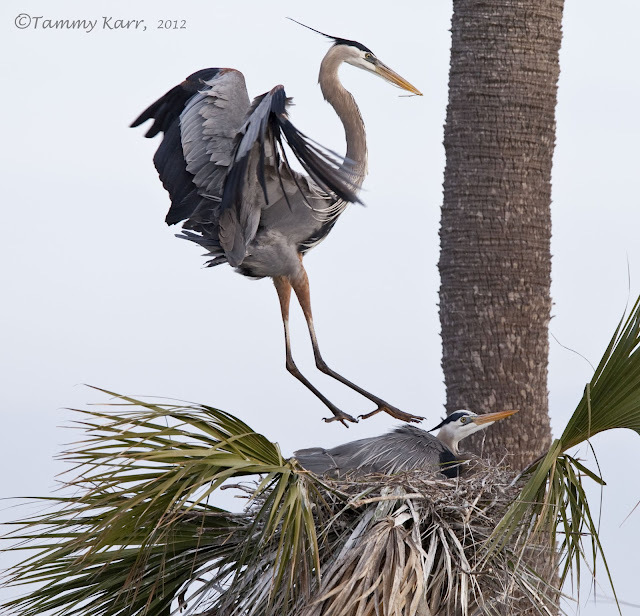 Stay tuned for the next post, to see what was happening in a neighboring nest! I'm speechless, Tammy! These photos are nothing short of stunning! 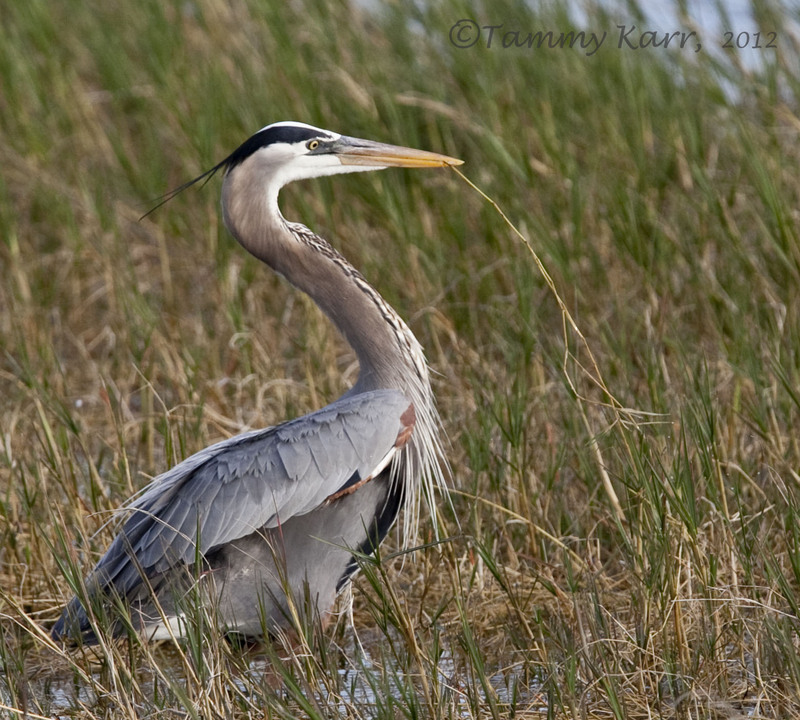 Herons are one of my favorite subjects and you've done a fantastic job! I can't adequately express how much I like these photos. Well done! Thank you so much Brian! The Great Blue Herons are great subjects! 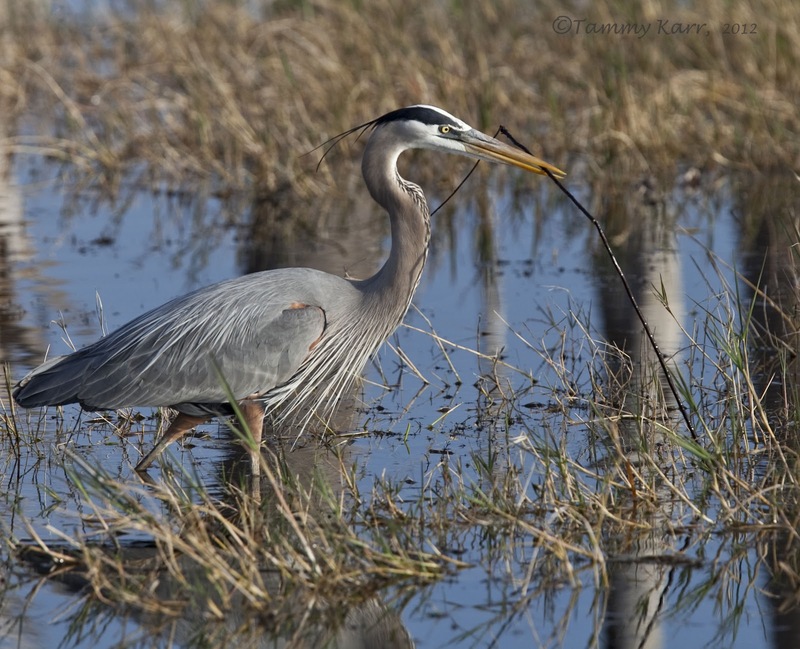 Another great series of Heron pics. You have an eldorado for birding in your neighbourhood I see :-) Good shots and nice words from the trip. amazing series! perfect lighting, and great action and focus. Beautiful story-telling as well. You are talented!! Thanks for your kind words Rachelle! 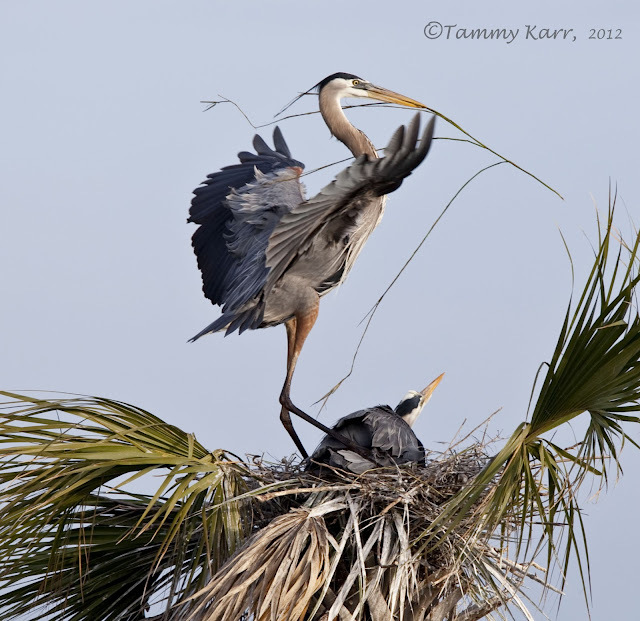 Tammy, these are terrific nesting behavior images, well done! you captured the action perfectly! love the sequences and the teamwork you showed here! Excellent work Tammy. It's fascinating, endearing, and beautiful all at once, almost too much to take. 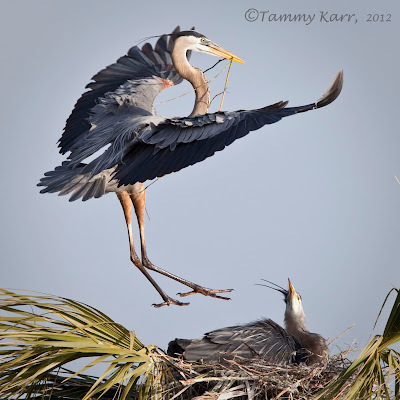 Lovely set of shots Tammy. We have snow here at the moment in Kent, UK. Roll on the better weather. I can almost feel the heat in your shots. 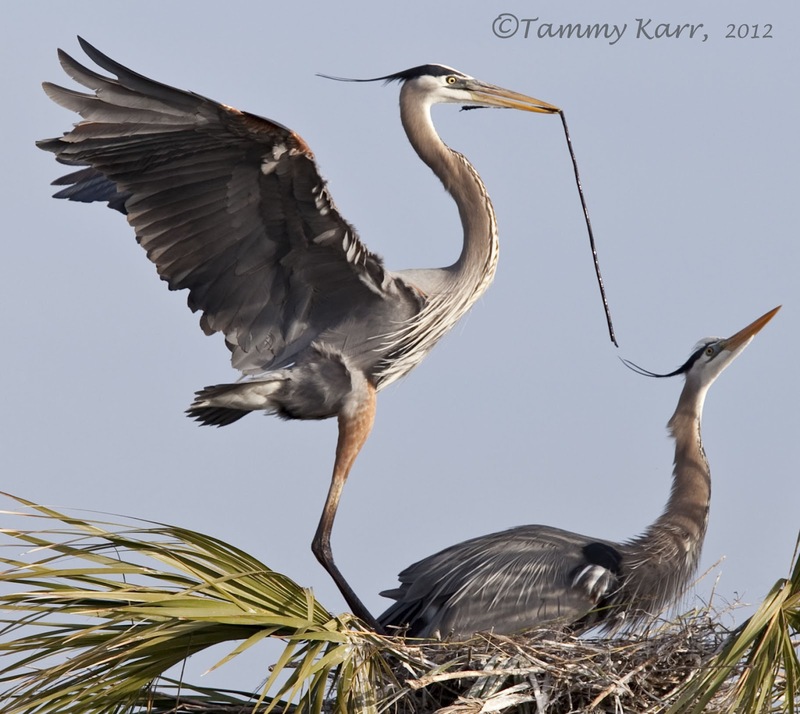 Well done Tammy,those birds are stunning. You have got to e proud of images like these. These birds really were amazing! Thanks Shaun. Some of the best heron pictures I've seen. Amazing stuff. I just found your site, and I am really impressed with the photography! Any chance you could share what your camera and lens is? Hi Ian, thanks for stopping by! I have a Canon 5d and used a 300 mm lens with a 1.4x for these photos. Wow! 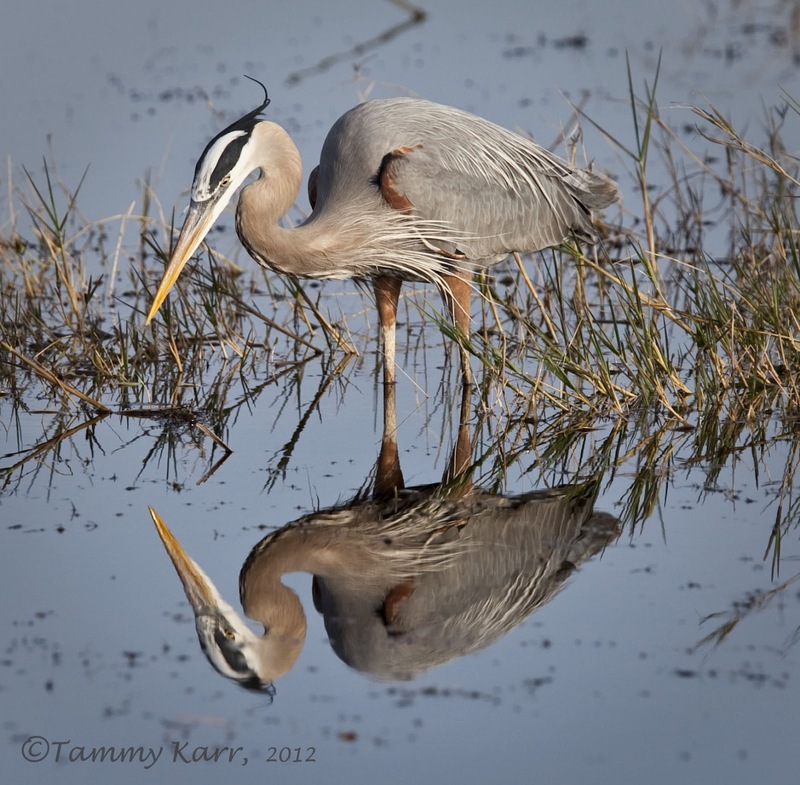 Absolutely stunning images Tammy. Lovely behaviour to have captured. 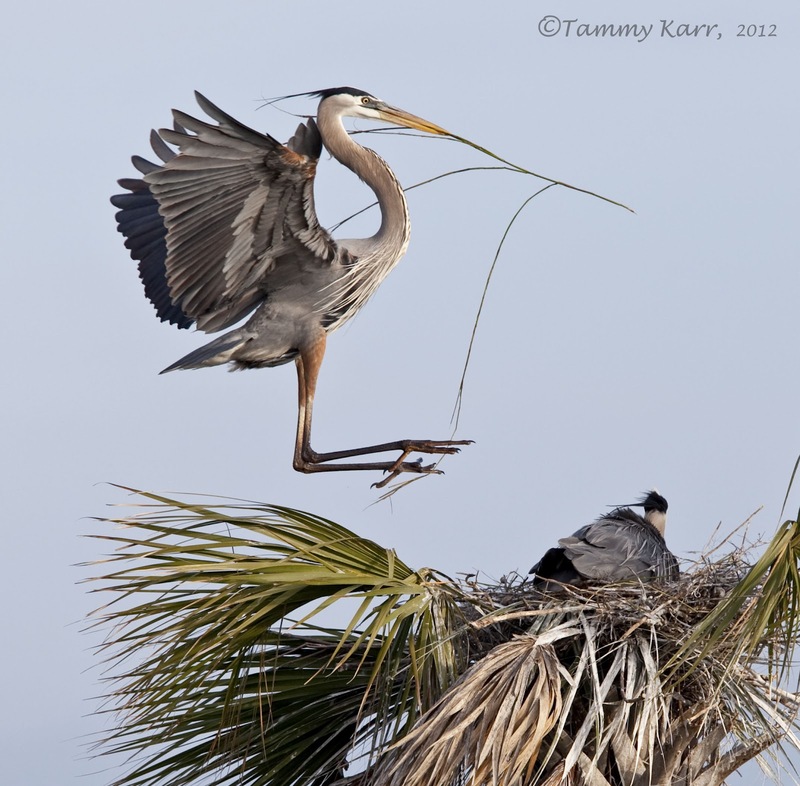 Great pictures Tammy, you captured the action perfectly ! Really great photos of this beautiful bird. 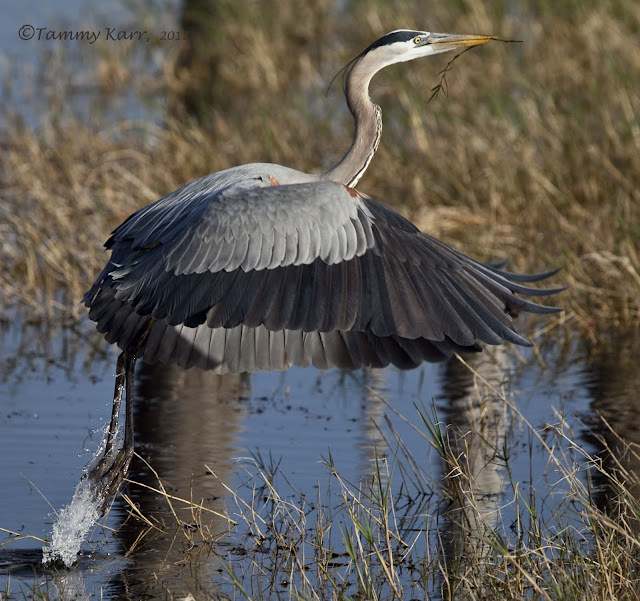 The weather is a little bit different here in Sweden now.....but within a couple of mounths the herons will arrive! Thank you very much! I hope the Herons arrive safely! Thank you for visiting our blog and to have left a comment. 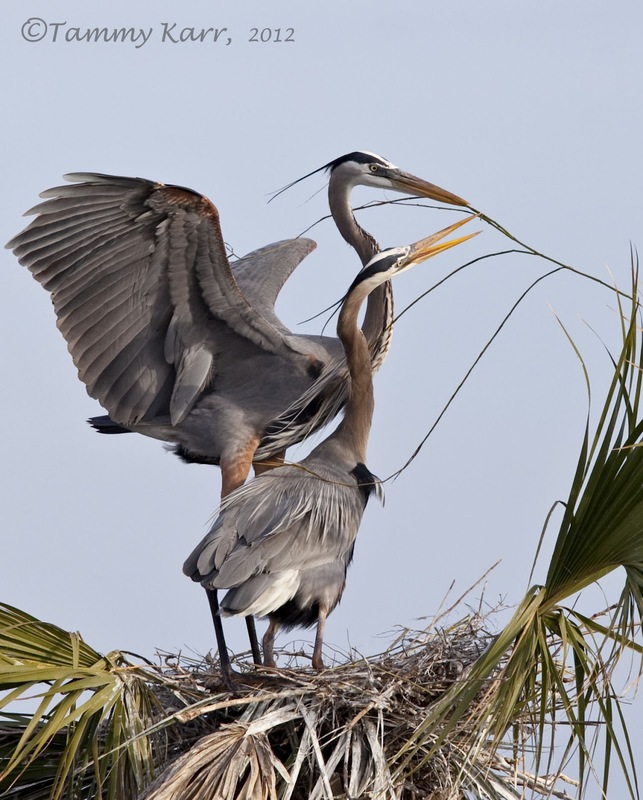 Oh, you got the Herons down to a tee, marvelous work done. Each one is a work of art. What equipment do you use? Thank you Bob! I use a Canon 5d, and for these photos a 300mm with a 1.4x. Fabulous shots Tammy, especially where you captured the heron as it lands on the nest - good exposure and SS. Beautiful images! We have visited Viera twice and truly enjoy all of the photo opportunities there. Thank you for visiting my blog and following. Beautiful to see this heron in his flight with the other. Nice shot too, where he's standing in the water, you've got there a fantastic mirror effect. Que calidad de imágenes Tammy, enhorabuena!! Que pasada amiga, que maravilla de fotos de esta preciosa pareja de Garzas, una serie del 10 te felicito. 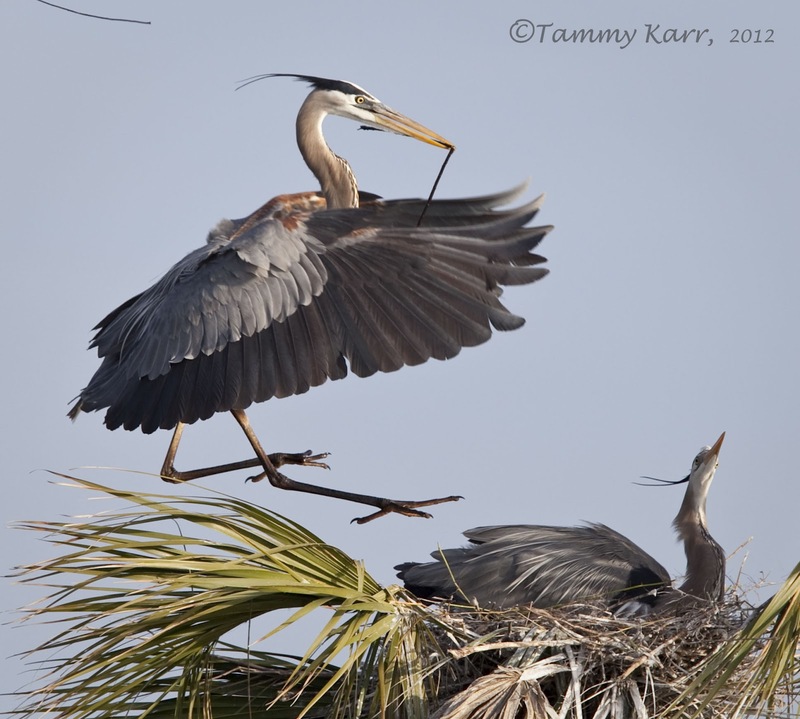 Hi Tammy, great set of pictures! First time on your blog - love it! Wow, what a wonderful series of shots. First-class photography! Interesante el seguimiento a estas bellas Garzas construyendo su nido.Muy buenas tomas,un gran trabajo.